The open data movement—the idea that certain data should be freely available to everyone—can drive innovation, make government and corporate activities more transparent and improve decision-making about natural resources. Global Forest Watch (GFW), an online forest monitoring platform, has helped make data accessible and visible to the public. Data that is open is provided in an online form that allows for direct management. Tools, such as easy-to-use mapping applications, enhance the “openness” of data by enabling users to derive more meaning and benefit from the information. Open forest data may be created and released by governments, companies, academics, civil society organizations, and increasingly citizen science. It can describe how forests are changing and being used by people over time. Understanding the geographic arrangement of data can help solve forest challenges. Finding open data for forests can be difficult. Those who own the data may be reluctant to share information for fear it will be misused or improperly cited, or because of intellectual property or confidentiality restrictions. A lack of international data sharing requirements and standards also limits access. GFW is working to meet these challenges to make timely, decision-relevant forest information available through data mining, partnership and advocacy. The Open Data Portal makes forest data easy to locate, preview and download. Users can create web-maps from the data using ArcGIS Online. Here’s how this kind of open data can help solve complex forest challenges. Opening the U.S. Geological Survey’s (USGS) Landsat archive of satellite imagery in 2008 made the GFW platform possible. Matt Hansen and a team of scientists used these images to create the first high-resolution global maps of annual forest change. The maps, made by analyzing over 1 million individual Landsat scenes, provided high-quality, up-to-date data for policymakers, companies and civil society groups to improve forest management. Before that, only 4 percent of the Landsat archive had ever been examined. Today, scientists, land managers and citizen activists are using the free, open archive of Landsat images to better understand environmental changes. Four agricultural commodities — palm oil, soy, beef and pulp and paper — are responsible for 70 percent of tropical deforestation. To try to reverse this trend, hundreds of companies recently made ambitious commitments to only source deforestation-free commodities. But companies can’t act on their commitments or be held accountable unless it’s known precisely where their forest commodities are coming from. This information lets companies trace products to the plantations where they were grown and verify that no deforestation occurred as a result of production. 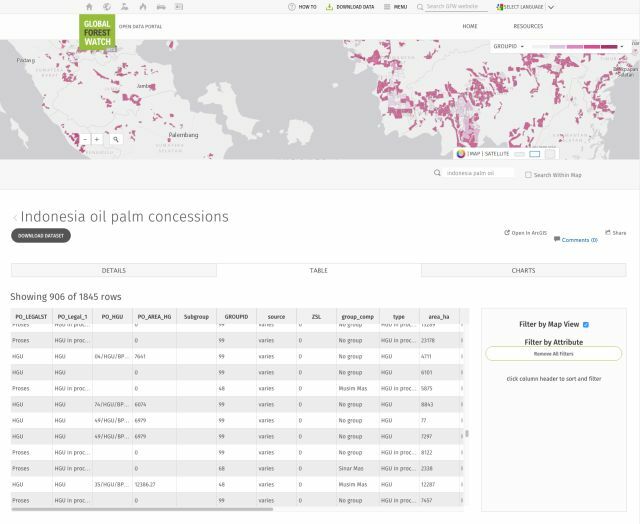 That’s why GFW Commodities leverages open data, such as maps showing where governments have allocated land to specific companies for agriculture development, to help companies, NGOs, and everyday citizens monitor the impact of farming on forests. 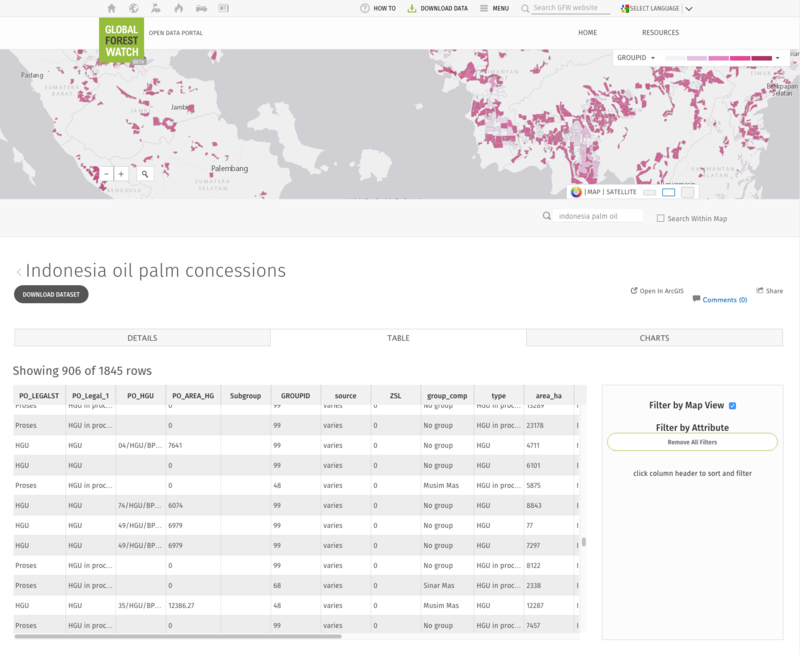 GFW also advocates for companies to release maps of their commodity production areas to promote more transparency and accountability about their commitments to corporate sustainability. Accurate, up-to-date information can improve land use planning, which is how governments decide what kinds of activities can occur in a particular area. 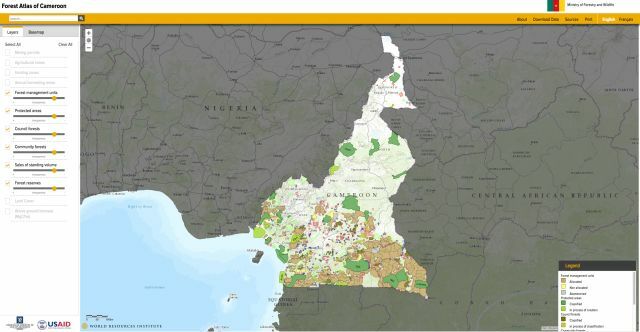 The Cameroonian Ministry of Forestry and Wildlife (MINFOF) collaborated with WRI on the first interactive forest atlas of Cameroon. Launched in 2005, the atlas shows how forest land are allocated for mining, logging, agricultural development, conservation and other uses. Updated annually, the atlas has helped MINFOF make smarter decisions about managing national forests. For example, the atlas allowed MINFOF to identify areas with potential illegal logging activity and determine which to investigate first by overlaying maps of logging roads with logging and mining permit boundaries. The Environmental Democracy Index shows that many countries do not require the proactive release of environmental information to the public, or require only a minority of government agencies to do it. Corruption can flourish without government transparency in this area, while decision-making can suffer without information about social and environmental impact. Furthermore, there is no global standard for proactive access to the most basic information about where governments have allocated forest lands to companies. No global data sets of areas used for logging, mining or agriculture development are available. Simply knowing the location of these areas would be an enormous breakthrough for many countries. 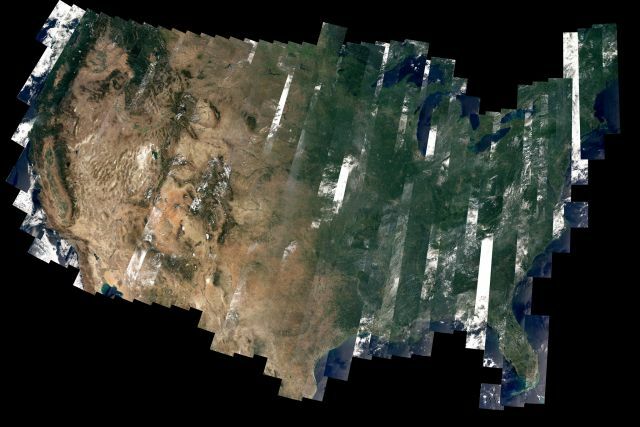 Governments should open their national satellite image archives, as USGS did in 2008. Furthermore, leading nations in satellite imagery collection should explore opportunities to add their data to a global open-access repository of satellite imagery. Companies committed to sustainable supply chains should release detailed maps of their production areas. International requirements and best practices for releasing information on where governments have allocated forest lands to companies would also help. GFW is a leading advocate for open data for the environment and will continue to collect and make forest data accessible through the GFW Open Data Portal and mapping applications.